Is wearing your favorite shoes a burden? Are you impatiently waiting for that event of the year where you are planning to wear the perfect shoes, but you are worried about the discomfort that they will cause? Or maybe you simply care about your daily outfit and want your shoes to match all the time. Regardless of the reason why you enjoy buying new pairs of shoes, we all know that wearing them for the first time can be excruciating. The best shoe stretcher sprays can be of great help in such a situation. Can you imagine how it is to be able to use products that eliminate this worry forever? Well, we can because we’ve been there. If you never thought that you could wear a pair of shoes for the first time and feel no discomfort whatsoever, then you should definitely try some of the best shoe stretcher sprays on the market. These products are created using a formula that is meant to soften different types of materials, such as leader or suede. It doesn’t help as much with synthetic materials, but if you care about your feet, you won’t even think about buying such shoes. Therefore, if you have wide feet, if you are between sizes or your foot bones are sensitive, then you will need to stretch the shoes a bit before being able to wear them comfortably. Shoe sprays that are meant to soften and expand the material that they are made of can be used with shoe stretchers or shoe trees, but also without any additional accessory. Are you looking for the best shoe stretcher spray for your needs? Then you need to check out the best 5 products on the market, analyzed and reviewed in the list below. Although it is true that any leather spray is good for your shoes, it is no secret that a premium product that is made to stretch luxury shoes without altering their aspect is unique. The effect that this spray from Simple Shine has on high-quality shoes is amazing. It is designed to stretch tight footwear and you can apply it on any leather, suede, nubuck or canvas materials. This means that you can trust it with your sneakers, office shoes, casual shoes, sports shoes, boots, brogues and what not. The spray comes in a medium sized bottle with a 4 ounce capacity. If you are concerned about using it properly, you shouldn’t. Applying it is fairly easy. All you have to do is to spray directly inside the shoe, either on the desired areas or all over the interior. Then you should place a shoe stretcher inside it and leave it there for a while. If you don’t own one, you can also take the shoes on and walk with them until you feel that they fit your feet perfectly. Although this is a safe product, you shouldn’t allow it to come in direct contact with the skin for too long. This is an animal cruelty free product that is trusted by some of the most pretentious customers. However, if you aren’t satisfied with its quality, the producer offers you 100% money back guarantee. 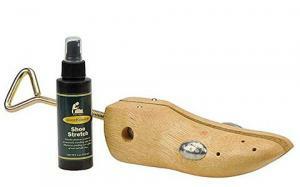 Another 4-ounce shoe stretcher spray that works amazingly on leather and other similar materials is brought to the market by FootFitter. It is a great product to own, as it can be used on all natural materials, such as nubuck, canvas, suede and more. The bottle has a stylish design and makes spraying very easy and comfortable. Its formula is meant to relax leather fibers so that the shoes can be stretched up to the size that you need. This makes it a great product for those of you who are in between sizes. Another size is available, too. You can choose to buy the 32-ounce bottle of the same spray, but that one comes at a different price. FootFitter is a manufacturer that focuses on creating high-quality care products for footwear. This spray is one of its best-selling products, as it can be used on all kinds of materials and it proved to be very efficient over time. After using this product and stretching the shoe, the result is permanent, which is why you should be careful about how much you stretch them. Applying this spray is a breeze. You can apply it directly on the inside of the material and use a wooden shoe stretcher for the best results. If you care a lot about the quality and aspect of your shoes, then you are surely one who doesn’t care how much a shoe stretcher spray costs, as long as it does its job as it should. This product from Shopkeeper is a classic, being brought to the market by a producer with history. It offers high-quality footwear care products since 1922, a fact which gives it a little more credibility. This product is actually a combo. It comes at a higher price, but it includes both a stretcher spray and a wooden shoe device that you can use to adjust the length and width of the shoe. You will be happy to know that the stretcher is suitable for both the left and right shoe. This spray has a formula that professionals adore, but this doesn’t mean that you cannot use it at home. It softens leather and other natural materials in no time. The wooden shoe stretcher is made of high-quality materials, has a screw-driven system and metal plugs. It also includes bunion plugs and corn pieces, so that you can stretch the leather exactly where your pressure points are. This stretcher is suitable for women’s shoe sizes between 6.5 and 11 and men’s sizes from 8 to 14. If you want to buy a combo that you will be using for a long time, this is your best option. If what you are looking for is an inexpensive, small sized shoe stretcher spray that is highly effective and you can carry with you in any bag, then you will love this product. It comes with a simple formula that helps you stretch any type of natural material. It doesn’t include a wooden shoe stretcher or any other type of device, but you don’t really need one, as it shows great results even after wearing the shoes at home. Its producer recommends using it cautiously on exotic leather. If you have such shoes, you should first apply a small quantity of product and proceed only if what you applied the first time isn’t enough. This product from Instant Comfort offers value for money, as it comes at a low price and offers the benefits of a premium product. Although it can be used for suede, canvas, leather and nubuck, you should always pay attention to the quantity of product that you are using. Unlike other similar product, with this one you can also stretch vinyl shoes and increase the comfort of your feet in no time. The 4-ounce bottle has a basic design that doesn’t necessarily inspire too much trust, but even so, you can trust it. The great thing about it is that it comes with money-back guarantee, so if you aren’t satisfied with it, you can ask for a refund. Another affordable product for shoe stretching is this spray from Footmatters that is meant to condition almost all types of shoes. It acts as a conditioner and although its main role is to assist with stretching the material, it is also a product that adds a lot of comfort to the skin. By comparison to other products in this list, you don’t necessarily need to apply it on the interior of the shoe. It can also be applied on the exterior. Its secondary purpose is to help you feel more comfortable while walking even though you just bought the new shoes. This spray stretcher can be used directly on suede, leather, canvas, nubuck or a combination of these materials. If you have stiff shoes, you just bought new ones that you need to wear right away or you simply haven’t worn your favorite pair in a while, then you will most probably experience some discomfort in the beginning. Instead of ruining your day and hurting your feet, it is smarter to use this product that doesn’t require too much waiting. As you start walking, you will feel the leather stretching and becoming more comfortable. Therefore, you don’t even need a wooden or plastic shoe stretcher. No matter how expensive your shoes are, they are rarely going to be comfortable from the first time you wear them. Especially if the material is natural, it will take a few days to start to stretch on its own. The good news is that you can accelerate the process and forget about the pain of wearing new shoes, by using one of the 5 sprays in our list. These are high-quality products that are suitable for both feet. They are extremely easy to use and can be used with shoe stretchers or shoe tree for optimal results. Either way, the effect of the spray is almost instant, so you can wear your favorite shoes even though you didn’t wear them in quite some time. Are you wondering how much can such a spray stretch shoes’ materials? Well, it all depends on the product, but normally, a good spray should be able to stretch them half a size.